After a rough week and a half, I think my life is ready to get back on track a bit. I was able to take my mom home from the hospital on Tuesday, and she's finally getting some energy back. We haven't met with the oncologist yet, but things are looking hopeful. So, I'm finally going to start school. It will be strange coming back a week and half later than the official start date, but I'm anxious to see the kids. I will have to miss some days to go with my mom to doctor appointments, but I'm glad that I have a job where I have the sick days to be able to be helpful to my family in emergency situations. Well, when it rains, it pours, my friends. Many of you who regularly read my blog know that my dad passed away rather unexpectedly in May of stomach cancer. This week, my mom was taken to the ER for a ruptured appendix, and when they got in there, they found a mass growing. Unfortunately, it turns out she has cancer. :( Needless to say, our family is facing its share of challenges. I've been at the hospital with her all week, and will be there with her this week as well. Last Thursday was supposed to be my first day of school with the kids, so this is not how I expected to start my school year. Luckily, I'm blessed with an amazing principal and fabulous colleagues that are so understanding of my situation. So, as far as my menu goes, I have easy things planned, fully knowing that I probably won't be home to prepare them. We have had to eat out much more than I would like, but that's life right now. Luckily I do have freezer items I can use if I am actually home on an evening. Super quick post of the menu. All-district back-to-school meetings start tomorrow and kids come Thursday, and I'm still not quite as ready as I'd like to be. Plus, Corey has cross country practice extra early this week due to these meetings, so I need to get to bed. Tomorrow I go back to school. :( I have to admit, I'm not quite ready, and it's simply because I haven't been away from school enough this summer. I have made a commitment to myself and my family for next summer that I will not work my summer away. It's the last one I have with Corey before he graduates! Yikes! I'm feeling a bit stressed tonight (just too much on the to-do list), so this is going to be a short post. I did my huge freezer stock-up last week (check out the recipes on my Facebook page), and I'm kind of tired of cooking, so the menu is pretty simple. I do have a couple of new recipes, so photos and nutrition info will be up as soon as possible. Place chicken breasts, Italian dressing mix, butter, lemon juice & chicken broth in the crockpot. Cook on low for 6-8 hours. When finished cooking, shred chicken with 2 forks. 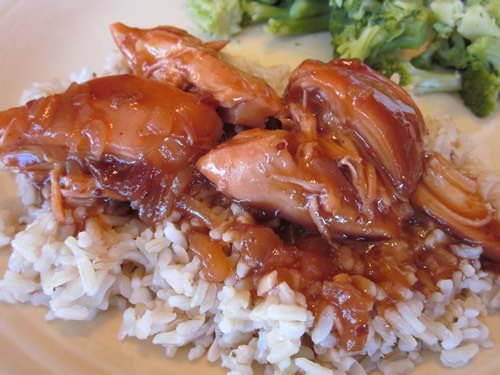 Serve chicken over egg noodles or rice and top with juices from crockpot. Preheat oven to 350F. Heat the olive oil over medium-high heat in a large skillet. Combine the flour, paprika and sea salt in a shallow pan. Drop each chicken breast in the mixture and toss to coat completely. Drop each chicken breast in the hot oil and brown on both sides (should take only about four minutes). Remove chicken breasts and keep warm on a plate. Pour the lemon juice in the pan and stir to deglaze. 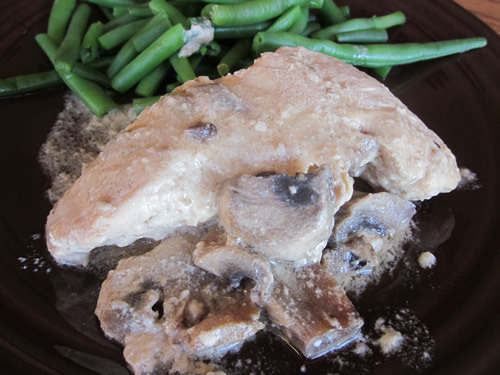 Put chicken breasts in a baking dish and pour juice on top. Sprinkle with brown sugar and lemon zest. Bake for about 20 – 25 minutes, or until cooked through. This is a nice, basic sloppy joe recipe. It makes about 16 servings, so it's a great one to use when stocking up the freezer. Cook onion in large non-stick skillet until soft. Add ground beef and cook through. Drain any fat. Add the remaining ingredients and simmer on low for about 20 minutes. Cool and freeze in two portions (I used old cool whip bowls, but freezer bags work fine as well). On serving day, thaw in microwave or on the stovetop in a saucepan. A tasty Asian-style marinade that's great for stir fry or for grilling. This is a freezer stock-up meal. Combine all ingredients except chicken. 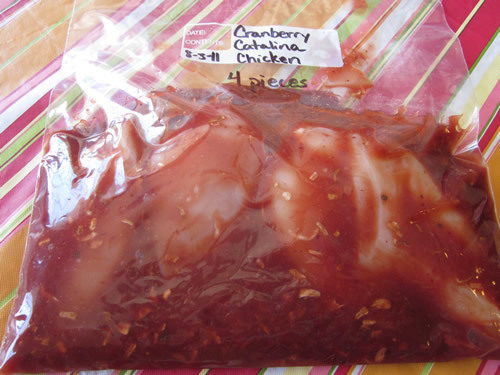 Place chicken breasts in freezer bag and pour marinade over chicken. Seal and freeze. On serving day, thaw chicken breasts. Grill over medium heat until cooked through and juice run clear. This is a tasty freezer meal your family will love. Mix together dressing, onion soup mix, and cranberry sauce. 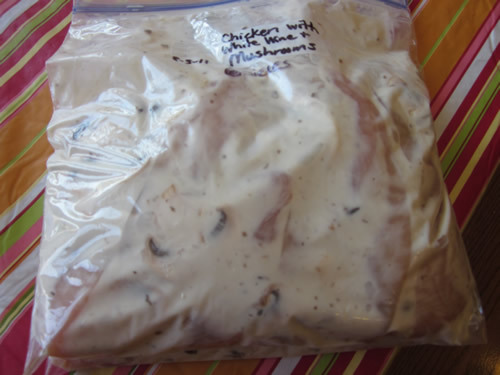 Place chicken and mixture together in a freezer bag. Seal and freeze. On serving day, thaw completely. Place chicken with cranberry sauce in greased baking dish, and bake uncovered at 350 degrees for 1-1 1/2 hours (will be much less if you use boneless, skinless chicken). Mix wine, soup, and mushrooms together. Stir flour into sour cream and add to soup mixture. Place mixture together with chicken in freezer bag. Seal and freeze. On serving day, place check and sauce in crock pot. Sprinkle with pepper and paprika. Cover and cook on low for 6-8 hours. Serve with pasta or potatoes if desired. This yummy chicken is great on its own or on a taco salad. It would even be good for chicken fajitas. It is a freezer stock-up recipe. Place 4 chicken breasts in each bag. Whisk together the other ingredients and divide the marinade evenly over the chicken. Seal and freeze. On cooking day, completely thaw one entree in the refrigerator. Heat grill to medium and cook chicken until internal temperature reaches 170 degrees F. Discard marinade. Another yummy marinade for my freezer stock-up cooking. Whisk together all ingredients except the pork chops. 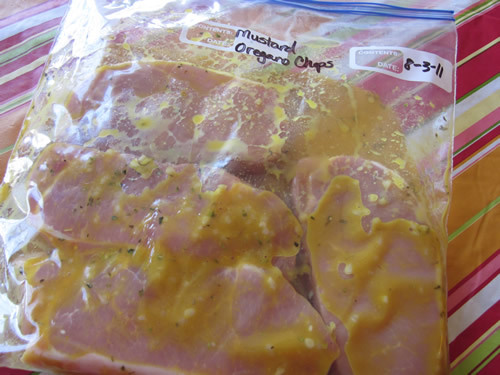 Place pork chops and marinade in a freezer bag. Seal and freeze. On serving day, thaw completely. Place pork chops and marinade in baking dish. Bake at 350 degrees for 1 1/4 hours, turning chops occasionally while baking. 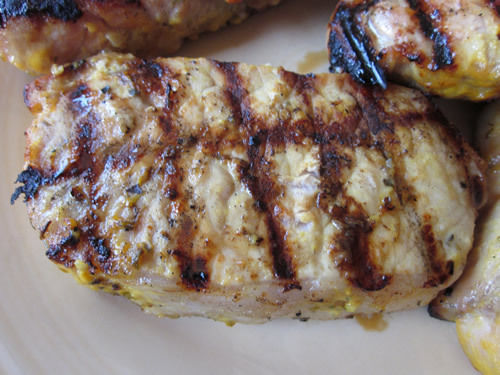 Pork chops may also be grilled. A tasty marinade for pork. This is a freezer stock-up recipe. Divide chops evenly among the freezer bags. Whisk together the remaining ingredients and divide the marinade evenly over the chops. Seal and freeze. On cooking day, completely thaw one entree in the refrigerator. 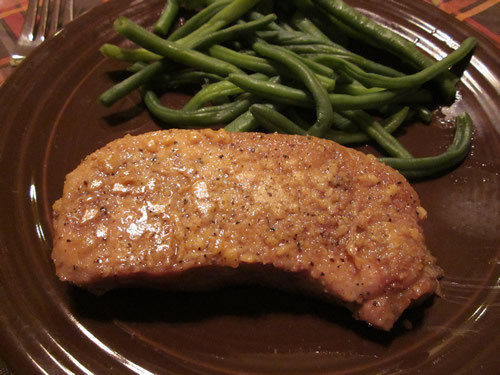 Heat grill to medium and cook chops until the internal temperature reaches 160 degrees F. Discard marinade. This is a wonderfully fragrant marinade with an Asian flair. It would be great in a stir fry if you didn't want to grill it. This is a freezer stock-up recipe. Put one steak in each freezer bag. Whisk together the other ingredients and divide the marinade evenly over the steaks. On cooking day, completely thaw one entree in the refrigerator. Heat grill to medium heat and cook steak to desired doneness. Discard marinade. Makes 2 entrees of 6 servings each. I hate beer, but it is a good marinade. This is another freezer stock-up meal. Put one steak in each bag. Whisk together beer, ketchup, brown sugar, vinegar, mustard, garlic, and pepper. Divide marinade evenly over the steaks. On serving day, completely that one entree in the refrigerator. Heat grill to medium and cook steak to desired doneness. Discard remaining marinade. This is another good stock-the-freezer recipe. Cut beef into 4 pieces (milanesa will already be sliced). Place meat in freezer bag with lime juice, tequila, garlic, salt, and pepper. Close bag securely. Freeze. On serving day, thaw beef and marinade completely. Drain marinade and discard. Grill beef over medium high heat. 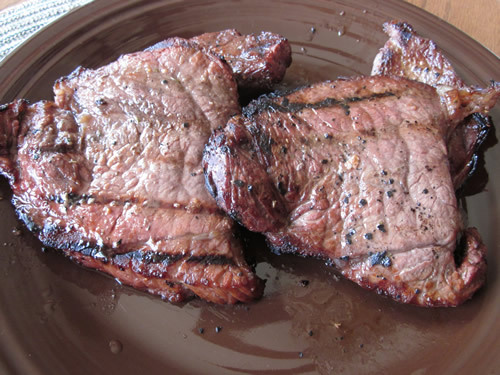 Carve beef into thin slices. Serve with your favorite fajita toppings. Our family loves to grill, and not just in the summertime. It's a year-round cooking method for us. I like to have meats marinated and ready to throw on the grill as soon as we get home from work. This a great recipe to use if you are stocking your freezer. Score meat in 1-inch intervals across steak. Place meat in freezer bag. Stir together lemon peel, lemon juice, sugar, soy sauce, oregano, and pepper. Pour marinade over meat and close bag. Freeze. On serving day, thaw and remove steak. Place on grill and cook on medium heat. Turn once during cooking and brush with marinade (always boil marinade 2-3 minutes after removing meat and prior to basting grilled steak). 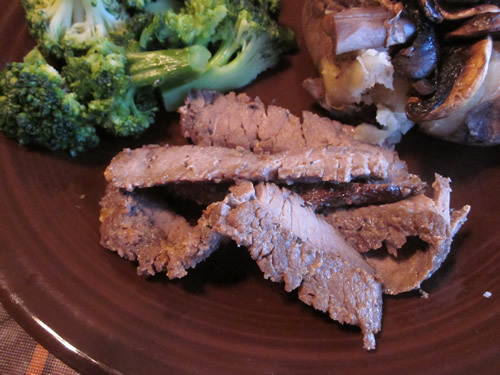 To serve, meat can be thinly sliced across the grain or served in larger pieces. This week is our vacation week, but I guess I should call it a "staycation" as we are not traveling this year. My hubby did take the week off of work so we can spend time together as a family before we go back to school. My sister-in-law and nephew are visiting for a couple of days, and my brother and his family are going floating with us later in the week, so we do have some fun things planned. The menu this week is pretty simple. We'll be eating out more because of our "vacation", and otherwise we are going to be grilling a lot. We are in a major heat wave right now, with temperatures over 100. Yuck!